Every day until The New Year we’ll be sampling from our elaborate selection of small-production, Grand and Premier Cru Champagnes. We’ll be featuring Champagne from some of the leading producers in the region: Like Paul Bara and his 26 acres in Bouzy, boasting some of the best Pinot Noir in the Montagne de Reims. Erick de Sousa, who over the past 30 years has refined the best of traditional thinking and progressive new methods to revitalize, transform and grow his estate to become one of the top producers in the Côte des Blancs. Brothers Charles-Henry and Emmanuel Fourny, producing beautifully rich Champagne in the highest rated Premier Cru village of Vertus. 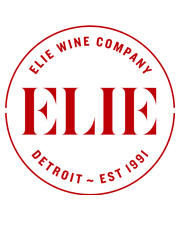 If you are looking for that extra special bottle we also have a selection of the foremost cuvées in all of Champagne, including 2004 Salon, 1999 Billecart-Salmon Le Clos Saint-Hilaire, and 2005 Philipponnat Clos des Goisses, to name a few. These are the work of passionate small producers and individual growers who are deeply connected to the particularities of each of their vine parcels and believe that wine is made in the vineyard first. They craft Champagne that express terroir by rigorous work in the vineyards, picking fruit at its peak, and employing minimal intervention in the cellar. 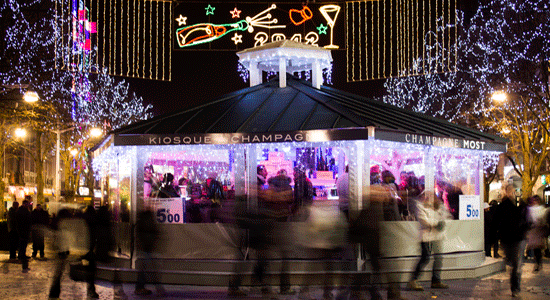 Champagne Kiosk at the annual Christmas Market in the city of Reims, France – the heart of the Champagne region.